It’s the end of an era: the last Tuesdays with Dorie recipe, selected by Dorie herself. Peanut butter cookie dough, rolled in chopped nuts, and filled with chocolate chips (as I did) or jam. I made mine tablespoon size rather than teaspoon, but there were no complaints that they were too big. I wish I could remember where I heard about TWD. I remember being in my hotel room during my week at Pastry Boot Camp, debating whether I should join the group. Then I saw that the group was going to be closing to new members, so in November 2008, I went for it. I baked Rugelach and I wrote a post about it. I haven’t baked every week, and haven’t come close to baking every recipe in the book, but I’ve stuck with it for over two years. I’ve baked a lot, I’ve learned a lot, I’ve had fun, and I’ve made some friends along the way. My top five list? That’s too hard. But I’ll tell you this: if my copy of Baking: From My Home to Yours was on fire and I only had time to tear out one recipe, it would be Chocolate Oatmeal Almost Candy Bars. If you haven’t made these, make them! When one book closes, another book opens. A new group is forming to bake through another Dorie Greenspan book: Baking with Julia. Keep your eye on the Tuesdays with Dorie site for more information on joining the new group. I hope a lot of you TWD bakers are joining the new group, and I look forward to meeting new bakers! Please take a moment to read Dorie’s lovely post about TWD. She’s got the cookie recipe posted too! Although I started blogging much too late to join this group, I’ve really enjoyed watching the rest of you do it. It’s hard to believe the adventure is over! These cookies look great. Such a sweet and bittersweet thing for TWD to be done! Catch ya with BWJ! Happy New Year, Jill! Gorgeous cookies, and guys need big cookies, little cookies just get lost or dropped in those big hands that guys have…experience talking. Love the size you made. These were so good…a great way to end the posting. And fun to know that the baking will continue on with the BwJ book. See you there…so happy you started blogging. Delicious man-sized kid cookies! See you in the new year! Great post Jill – I remember my first rejection (no new members) – I was crushed. But so glad I checked again! I made large ones too – just cuz it was easier! Looks wonderful for a final TWD post! I’m so glad you decided join the group Jill, I’ve really enjoyed getting to know you! I won’t be baking with the new group, but I’ll be following along for sure 🙂 Your cookies look wonderful, I went with the chocolate option too! I am so very excited for the new book, and new bakers, too! Thanks so much for baking along with us all this time. Its been so much fun and there is so much more fun to be had. I’ve so enjoyed our friendship over the last few years. Your comments and encouragement have kept me going. Thank you SO much for that and for so many other things. I can’t wait to bake along with you in February! It was fun wasn’t it. Glad to see you will be ‘Baking with Julia’. It would be hard to give it up completely. I have several recipes left to make so TWD will go on for me. I agree, the chocolate Oatmeal almost Candy Bars are the best! I can only make them if I have a very large group to feed–I have poor self control. TWD has been an awesome experience, I’ve met so many wonderful bakers like you Jill. thanks for your kind comments. Hi Jill, so glad you joined TWD – I have enjoyed getting to know you through your TWD posts. 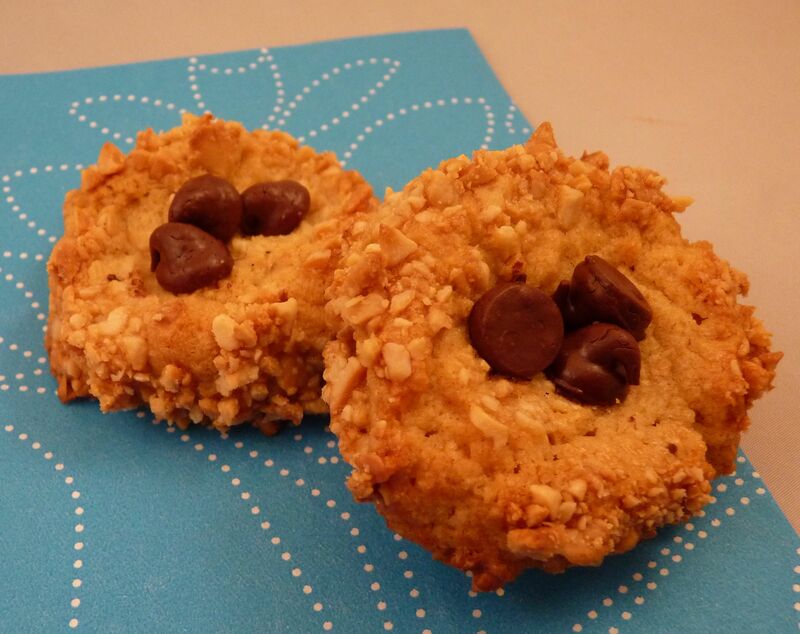 Love the choc chip filling – a girl after my own heart with chocolate and peanut butter. The bars were a hit! But these cookies look also very, very good! Looking forward to the new book! Ciao Jill, I loved reading your blog and will be happy to go on baking together ! Baci and Happy New Year ! Those are awesome cookies! Enjoyed cooking along with you and reading your blog each week. Have a happy new year and hope to see you around in 2012. Looking forward to baking with you again. Beautiful cookies, Jill! So looking forward to baking with you through BWJ! 🙂 Best wishes for 2012! I wonder what my “on fire” recipe would be…maybe the carrot cake. So glad you are continuing to the new book. Should be fun! love those almost candy bars! It has been fun baking along with you, so glad you joined the group! These cookies look yummy and cute! Baking with Julia would be a fun book to bake along with–so many neat recipes! Your cookies look great! I too look forward to baking with Julia and am glad so many TWDers are coming back for more. Mmmm. . .can’t think which recipe I’d rip out of my book if the house was on fire. I know I could buy another copy from the book store, but my book is filled with my comments and covered with flour and chocolate splotches. It’s like an old friend. Looking forward to baking with you and other friends in 2012. It’s been a lot of fun, hasn’t it? I had the same experience about being on the fence joining TWD and then jumping in when membership was about to close. I am excited for our new challenge in February. A happy 2012 to you! It has been so fun baking through this wonderful book and meeting new people! I love the comment about only having one recipe to save and it makes me wonder which I would pick. Thanks for sharing!